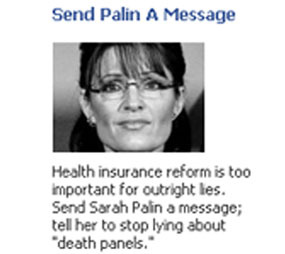 Group Runs Facebook Ad Asking Palin to "Stop Lying"
Former Alaska Governor Sarah Palin set off a frenzied debate about health care reform when she accused President Obama of planning to establish "death panels" via health care reform. Now, proponents of the president's health care agenda are taking to Palin's preferred medium to attack her claims, with a Facebook ad asking Palin to "stop lying." The labor-affiliated group Americans United For Change is running the Facebook ad directly targeted at the more than 800,000 listed "supporters" of Palin on Facebook, according to Greg Sargent of the Washington Post blog the Plum Line. "Health insurance reform is too important for outright lies," the ad says. "Send Sarah Palin a message; tell her to stop lying about 'death panels.'" The ad reportedly directs people to a page on the Americans United for Change Web site with a submission form to send a letter to Palin. The page also includes a video indicating that the "real" death panels are insurance companies that deny customer claims for important treatments. "If we don't confront the outright lies and liars as we did in 2008 then we allow the health insurance industry and their Republican supporters to swift boat health care reform," the page reads. The ad attacks Palin on the ground on which she appears to be most comfortable. Without a political office or any other platform from which to express her views, Palin has aggressively used Facebook to keep up her high profile, most recently with notes on the social networking site about health care reform. It has yet to be seen whether rebutting Palin's false "death panel" claims on Facebook proves any more effective than doing so through traditional media. As the Washington Post points out, the persistence of the death panel rumor is "a stunning illustration of the traditional media's impotence."